Author: Michaël Marsset, Wesley C. Fraser, et al. Using spectroscopy to learn about the compositions of Kuiper Belt objects (KBOs) has typically been impossible because these objects are generally so faint (due to their great distances from Earth of 30–40 astronomical units or more). 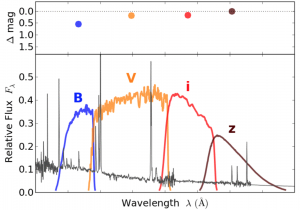 One solution to this problem is to take “broad-band” filter measurements — instead of separating the object’s light into individual wavelengths as in spectroscopy, astronomers take images using filters that select wider ranges of wavelengths (see Figure 1). While this technique sacrifices detailed wavelength information, it increases photon counts, making even faint KBOs measurable. The difference in flux between images in two filters gives a “color.” Unfortunately, many KBO surveys have taken images in only one filter. Thus, many of the ~2,100 currently known KBOs don’t have associated colors. Today’s paper details results from ongoing Col-OSSOS, or the Colors of the Outer Solar System Origins Survey, which uses the Gemini-North telescope in Hawaii to measure the colors of select objects discovered by OSSOS. Today’s authors compiled the largest KBO sample to date with well-measured colors — 229 KBOs in three different filters. Previous surveys considered must have published their telescope pointing history and taken observations in filters comparable to the Col-OSSOS filters. 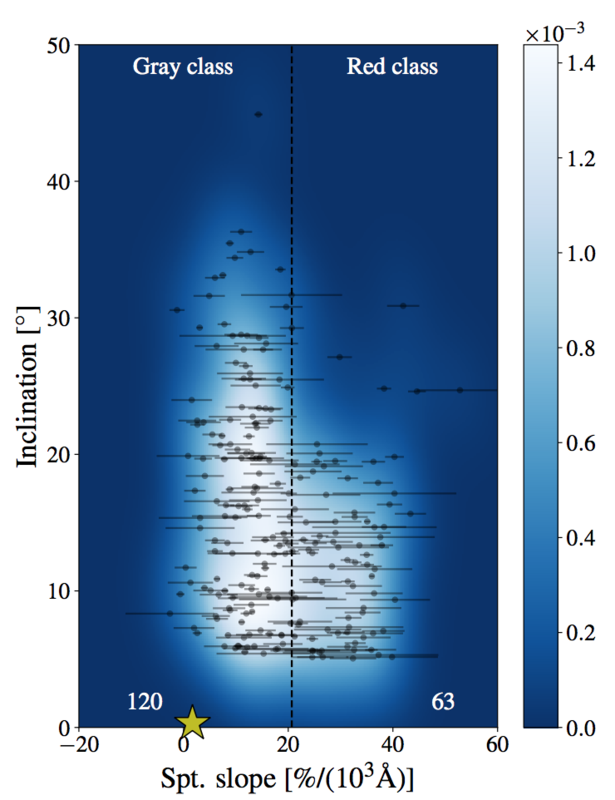 Objects must be smaller than ~440 km, to avoid the range of sizes in which KBOs transition from large and ice-rich to small and depleted of ices. The authors were only interested in colors due to rock composition, not in colors due to the presence of ices. Objects must not belong to known families with distinct compositions/colors (like the icy collisional family of Haumea) or pass too closely to Jupiter. When all was said and done, the authors had a sample of 229 KBOs whose colors fell into two distinct populations that the authors termed “gray” and “red.” They then examined the orbital inclination distributions of the gray and red KBOs in turn. Marsset et al. find that the inclination distributions of the two color populations are significantly different, as measured by a variety of statistical tests. Specifically, they find that the red population of dynamically excited KBOs have smaller inclinations in general than the gray KBOs (see Figure 2). This suggests that the red KBOs have experienced less disruption than the gray KBOs over our solar system’s history. Moreover, when the gray and red populations are categorized further into specific dynamical classes (e.g. objects in nearly circular orbits or objects that are actively scattering off of Neptune, for example), the same trend emerges. This means that the overall trend is not biased by any single subpopulation of objects. But what if the observed trend between color and orbital inclination in the gray and red KBO populations is simply due to biases in the surveys? Previous studies have shown that redder objects tend to be more reflective, making them brighter and more readily detected. The authors also note that few surveys target higher inclinations and that those surveys tend to use redder filters. They use both analytical calculations and a survey simulation code to estimate the effects of these factors. They find that the potential biasing factors would actually result in more red KBOs detected with high orbital inclinations — exactly opposite of the trend they find in the data! Furthermore, their survey simulations show that they find many fewer red objects than their models predict. This implies that the color-inclination trend observed is an intrinsic feature rather than one produced by survey bias. So why does this trend between color and inclination exist? Prior to today’s paper, two hypotheses competed for the top spot: (1) all KBOs were originally similar, but collisions and other resurfacing processes altered both their colors and inclinations, and (2) the two color populations originally formed in different locations in the protoplanetary disk from different materials, and the gray KBOs were flung outward into the Kuiper Belt. Since collisions affect both orbital inclination and eccentricity, the authors would expect a color-eccentricity trend as well if hypothesis (1) were correct. However, no such trend exists in the data, suggesting that the two color populations did, in fact, originally form in different regions of our solar system. The results from today’s paper are suggestive of hypothesis (2), yet 229 KBOs is only a tiny fraction of all the KBOs waiting to be discovered and studied. Col-OSSOS is still taking data, the Large Synoptic Survey Telescope (LSST), which will turn on in 2023, is expected to detect ~40,000 KBOs with well-measured colors. And that will still only be a fraction of the predicted number of KBOs (possibly more than 100,000 larger than 100 km, and even more smaller than that). There is still a lot of solar system to explore! Stephanie is a physics graduate student and NSF graduate fellow at the University of Michigan. For her research, she studies the orbits of the small bodies beyond Neptune in order learn more about the Solar System’s formation and evolution. As an additional perk, she gets to discover many more of these small bodies using a fancy new camera developed by the Dark Energy Survey Collaboration. When she gets a spare minute in the midst of hectic grad school life, she likes to read sci-fi books, binge TV shows, write about her travels or new science results, or force her cat to cuddle with her. 1 April 2019 Features 2 What’s with Asteroid Ryugu’s Weird Shape?